"Vegan egg substitute is a powder that you add water to, and can be bought at most grocery stores. It is fat free, vegan and has few calories per 'egg'. If you can't find it, use 6 eggs, but remember that the fat content will go way up." In a large bowl combine brown sugar, white sugar, flour, baking soda, baking powder, cinnamon and salt. Stir in carrot and apple; mix well. In a small bowl whisk together egg substitute, applesauce and oil. Stir into dry ingredients. Bake in preheated oven for 20 minutes. Let muffins cool in pan for 5 minutes before removing from pans to cool completely. Whenever someone says vegans eat nothing nice - shove one of these delicious muffins in front of their face and they'll shut up! They are easy, quick and delicious. 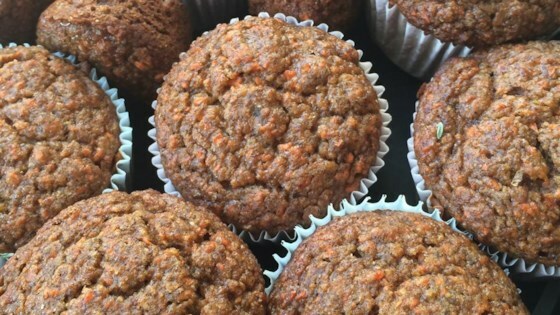 This is one of the best muffin recipies I have ever made! And the best part is that it's vegan! They are moist and delicious. I made smaller muffins so I got 24 instead of 12.